The iPhone’s call forwarding feature is basic. You simply flick a switch to enable the feature, and then enter the phone number where you want your calls to be diverted. Our tutorial on how to forward iPhone calls should get you started. However, you may be wondering why iPhone has stuck to such a basic forwarding feature while early Nokia phones have advanced call diverting features which allow users to forward calls when the phone is busy, left unanswered, or when you are unreachable. The answer is that the iPhone also has those features, but they are hidden. This tutorial will show you how to find and use conditional call forwarding on iPhone. By activating conditional call forwarding on your iPhone, you can set your iPhone to forward voice calls, data calls, and fax calls. You have the option to activate all three call types (voice, data, fax) or only one or two services. Apple believes in keeping things simple for its regular users, so it has decided to make conditional call forwarding a hidden feature. You are probably eager to learn how to activate a feature from basic phones of the early 2000’s. Let’s get started. Important note: Call diversion or call forwarding features may be network dependent. Some cellular network service providers are offering them for free while others require activation and/or payment. You may verify this with your network provider support staff. 1.Open iPhone’s Phone App from your Home screen. 2.Tap on the Keypad tab. 3.Enter this code to enable forward calls when iPhone is busy: *67*Enter Phone Number#. For this example, the number to forward calls to is 123467890, so we will dial in *67*1234567890#. 5.Wait for the feature to be activated. 6.Call forwarding when your phone is busy is now activated. 7.To disable call forwarding when your iPhone is busy, dial #67#, and press the Call button. 8.Wait for the feature to be deactivated. 9.The feature is now deactivated on your iPhone. 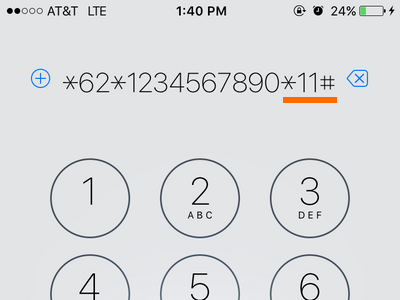 3.Enter this code to enable forward calls when iPhone is left unanswered: *61*Enter Phone Number#. For this example, the number to forward calls to is 123467890, so we will dial in *61*1234567890#. 6.Call forwarding when your phone is left unanswered is now activated. 7.To disable the feature, dial #61#, and press the Call button. 9.Call forwarding when your iPhone is left unanswered is now deactivated on your iPhone. 3.Enter this code to enable forward calls if you are not reachable *62*Enter Phone Number#. For this example, the number to forward calls to is 123467890, so we will dial in *62*1234567890#. 6.Call forwarding if you are unreachable is now activated on your iPhone. 7.To disable the feature, dial #62# and press the Call button. 9.Call forwarding when you are unreachable is now deactivated on your iPhone. For example, dialing *62*1234567890# will forward ALL calls whenever your phone number cannot be reached, as shown in one of the steps above. If you want to enable the feature exclusively to voice calls, then dial *62*1234567890*11#. Do you have other hidden tips in using your iPhone,or are you having issues with any of the steps outlined in this article? We want to hear what you would have to say. Leave us a comment in the section below.